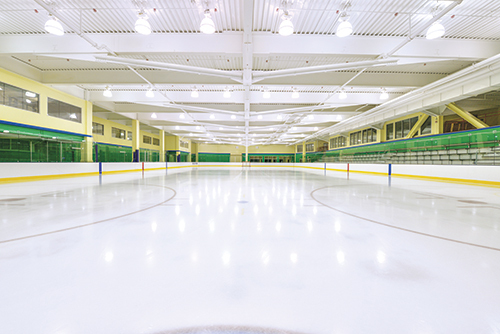 The ice rinks at Chelsea Piers welcome skaters of all ages and ability levels for ice hockey, league play, figure skating, general skating, birthday parties and more. 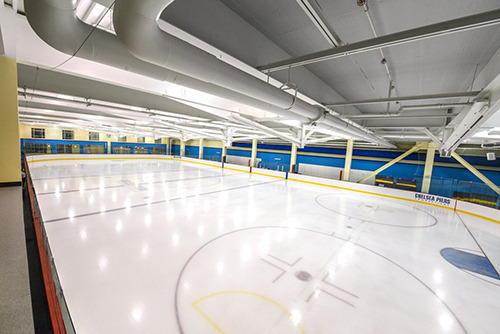 The dual-rink facility located at the Stamford, Connecticut sports complex operates seven days a week and is the premier ice skating facility in Fairfield County. Chelsea Piers Connecticut is home to an extensive ice hockey program, including youth and adult ice hockey leagues, lunch time hockey for adults, summer and holiday camps, Mite Development and Mite Cross-Ice leagues for kids, and a full roster of youth and adult weekend and holiday tournaments. Advanced programs can be complemented with a structured off-field athletic training regimen provided by Chelsea Piers Athletic Club trainers or BlueStreak Sports Training, located within the Chelsea Piers Connecticut complex. A complete range of Freestyle Sessions are offered year-round for every skating level, including ice dancing and pairs. Harness training and customized off-ice conditioning classes are also available. Private on-ice instruction is available for an additional fee. Since 1969, the Sky Rink Skating School at Chelsea Piers in New York City has instructed skaters of all ages and levels in both figure skating and hockey using a progressive, station-based format and complete off-ice training. Building upon this tradition of excellence, the Skating School at Chelsea Piers Connecticut offers private instruction and group classes taught by a professional coaching staff. General skating hours are available for individuals and organized groups interested in spending a fun day on the ice. Rental skates and helmets for children are available. The ice rinks at Chelsea Piers are a popular location for fun-filled, hassle-free skating parties. Youths and adults alike enjoy skating on our beautiful, new NHL-sized ice rinks. A wide variety of private and semi-private party rooms are available. To learn more about birthday parties at Chelsea Piers Connecticut, click here. Chelsea Piers Connecticut is home to the National Women's Hockey League team, the Connecticut Whale. For more information about the league, including the game schedule and ticket purchases, please click here.